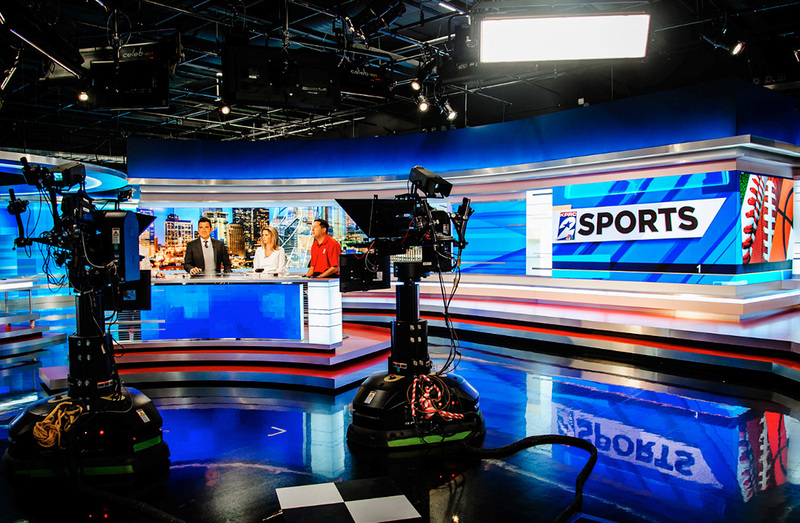 In the world of studio and broadcast environments, lighting and camera angles play a crucial role in the overall experience. 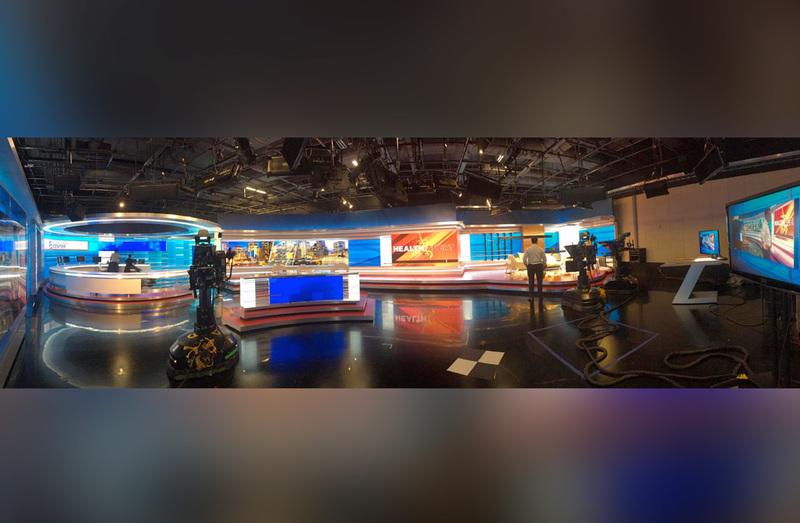 From reflections bouncing off the surface of materials used in the news desk to the cameras dancing around each other throughout the newscast, the complex must always appear simple. 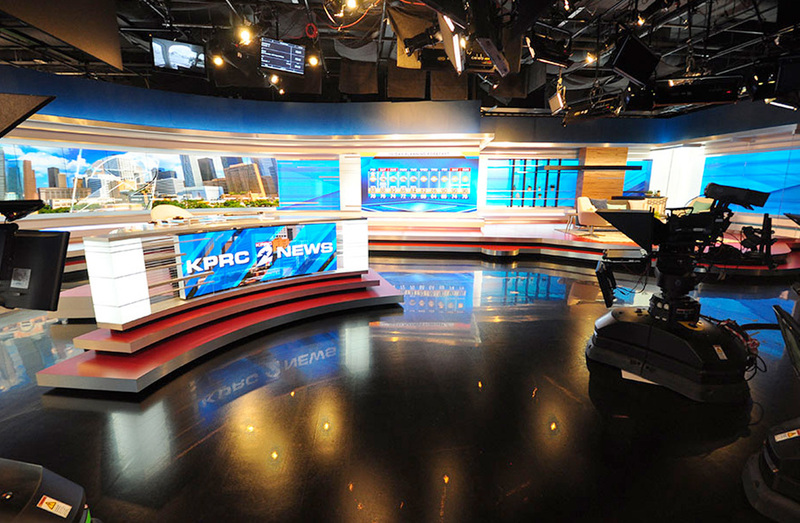 Backgrounds matter and must be flexible and fluid in every shot, from every angle. 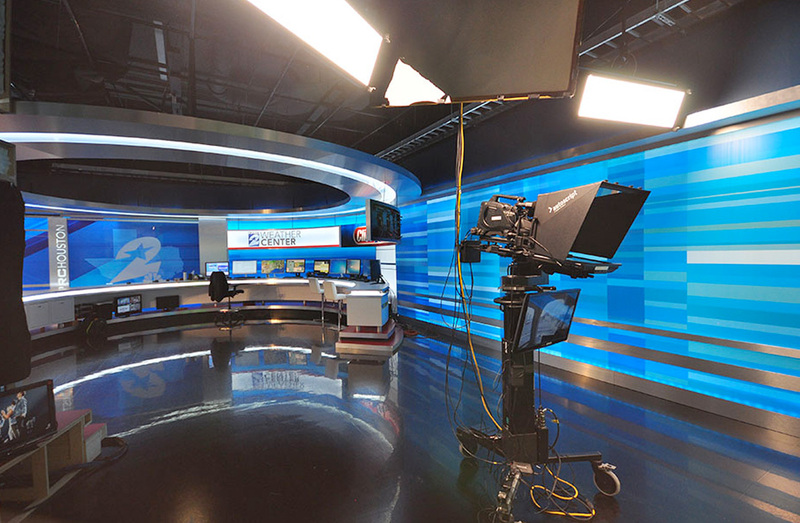 From the Main Anchor Desk and Mobile Anchor Desk to the Weather Center, Header Ring around the Anchor Station and the ultra-flexible News Cube, high-end technologies are intrinsic to the design. 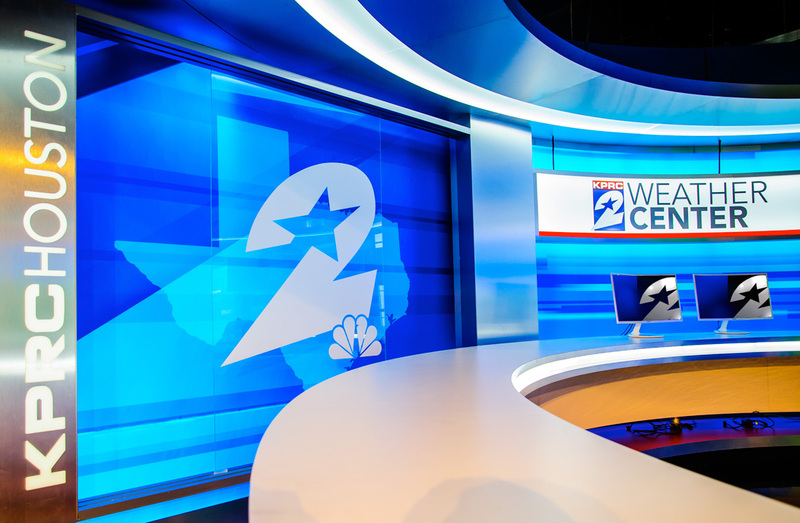 The Curved Main Anchor Desk includes a flex-screen curved video panel backed by a curved Plexi-panel with decorative metal finish accents. 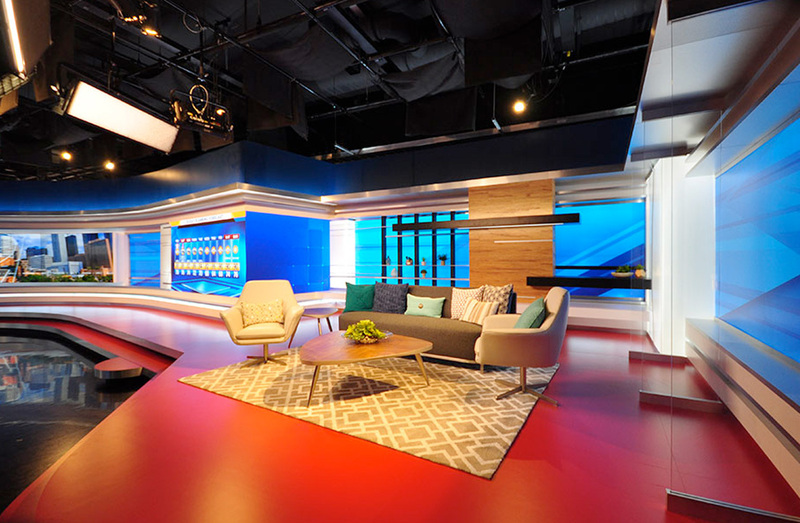 As seasoned fabricators and builders, 2020 Exhibits excels at spec’ing out material selections. 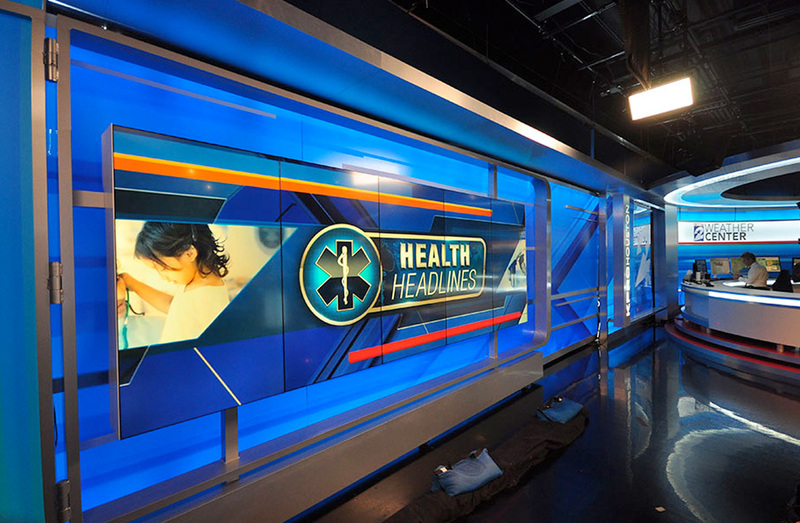 The Mobile Anchor Desk and Risers have a vertically curved base, with the mobile anchor desk houseing flex-screen curved video panel. 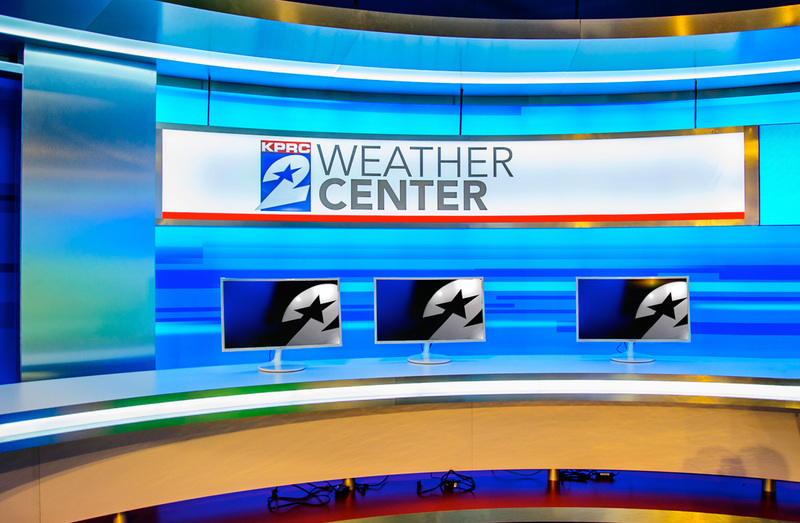 In Houston, the weather is news. 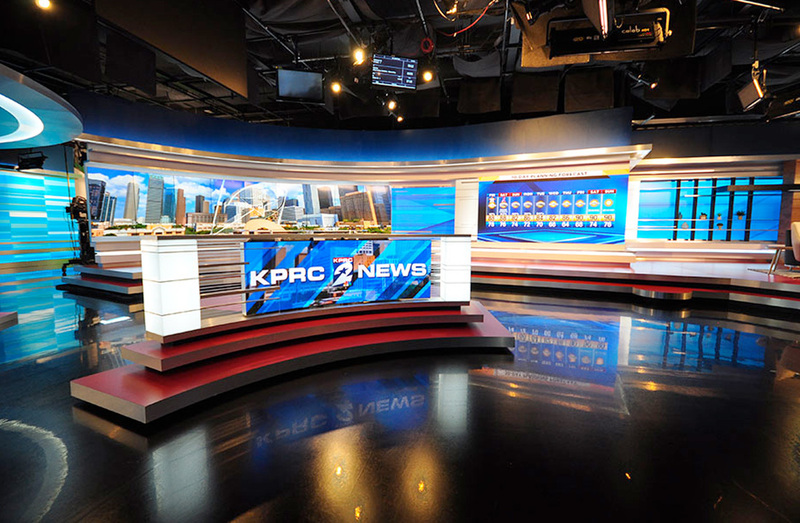 It comes as no surprise then that the KPRC Channel 2 Weather Center and Header Ring Round Anchor Station does not disappoint! 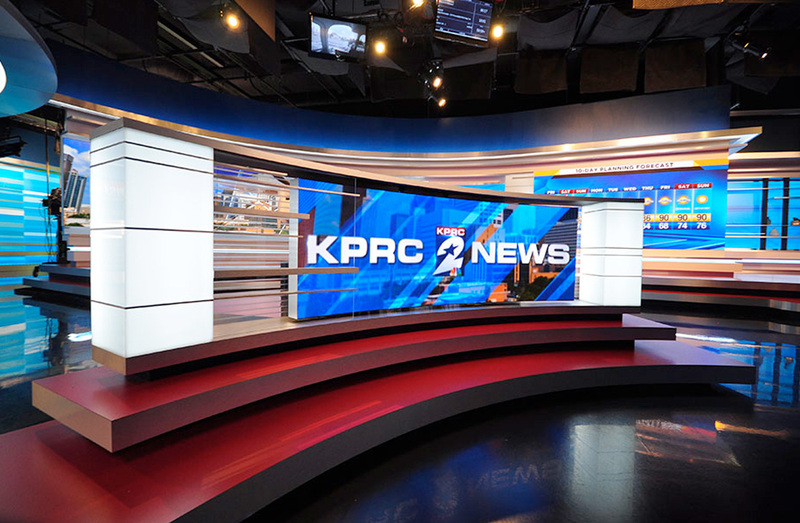 Providing a robust and distinctive presence in the news studio, the Weather Center Ring shoots features decorative Plexi infills at the front, and a radiant, backlit KPRC logo. 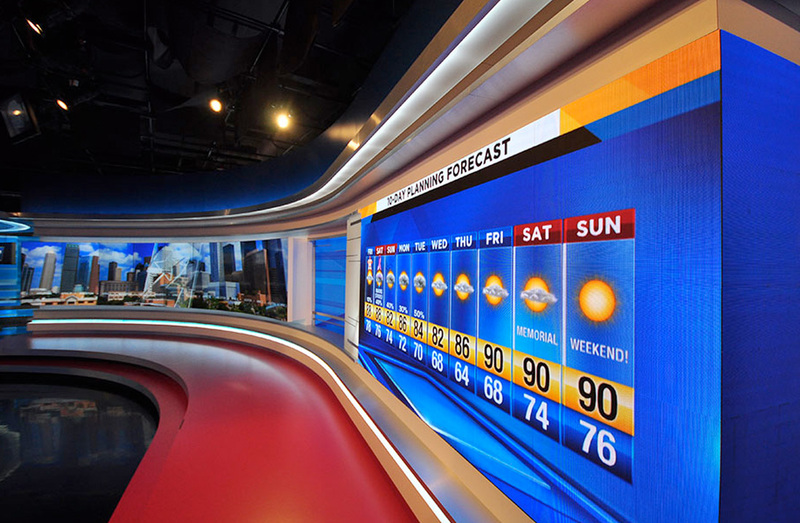 No matter the forecast, this state-of-the-art Weather Center casts a bright light and shoots beautifully, from all angles. 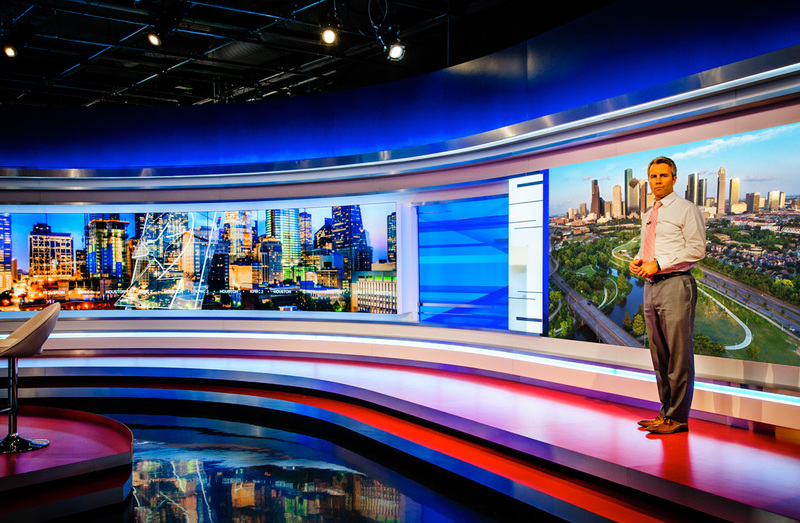 The broadcast center also features a stunning Articulating Video Wall that is comprised of 5 x 5 vertically mounted video monitors. 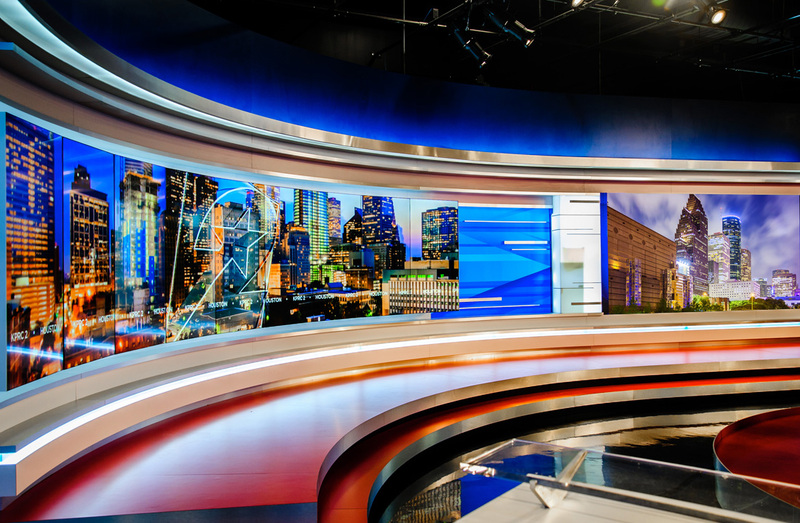 Custom designed and operating from one single pivot point, this Articulating Video Wall is a remarkable sight, integrating the best of engineering, creativity, and design. 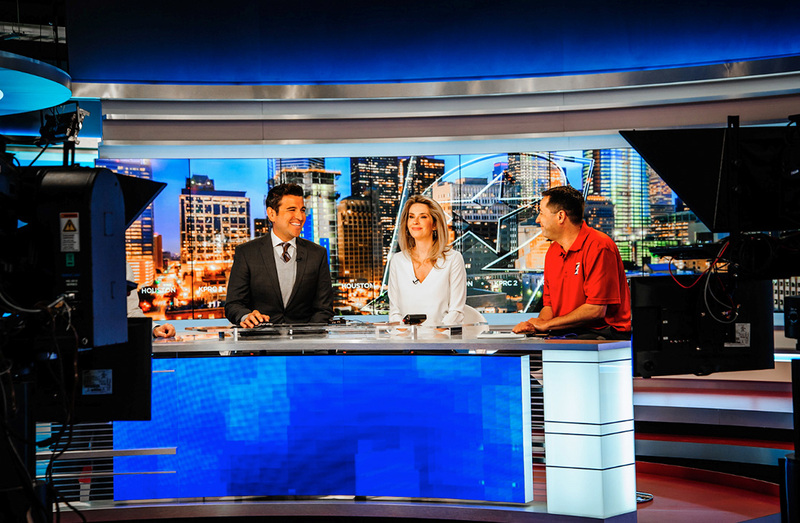 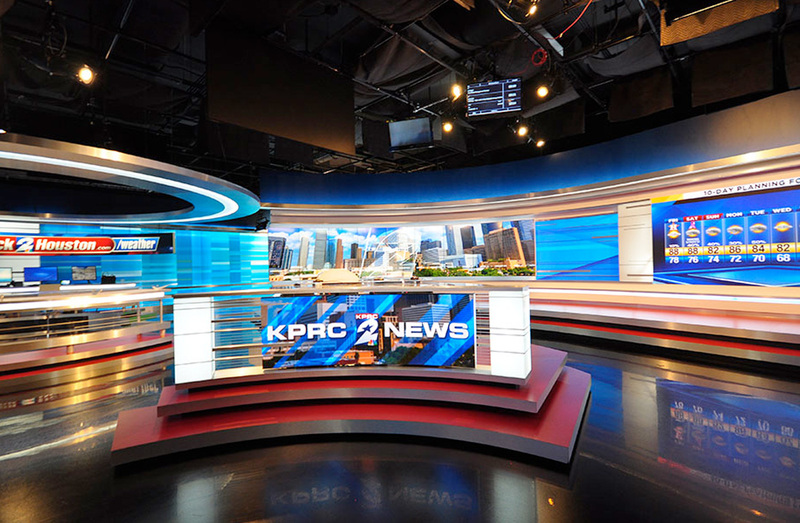 To see more, tune into KPRC Channel 2 News for a peek at this modern and dynamic news environment.